Integrity, craftsmanship and hands-on commitment are visible in everything we do. For more than 30 years, we have been designing and building exceptional custom homes. As a family-owned and operated business, we're not afraid of hard work — in fact, it's what we're noted for. We're with you from day one, right through the day you move into your new home. Working together, we turn your dream home into a reality. At StoneGate, the home-building process is about more than walls and ceilings: it's about commitment. We believe that close communication between buyer and builder throughout the entire process is the only way to assure that you'll end up with exactly the type of home you want. 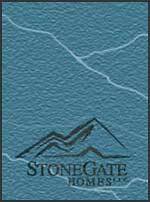 Stonegate Homes is a custom builder of new homes in Colorado Springs & custom builder of new homes in Estes Park, Colorado. Stonegate Homes has been designing and building exceptional custom homes for over 30 years.